Brimming with both visual and textural appeal, the bold Whitney Velvet Sofa is a breath of fresh air in the modern or eclectic aesthetic. Available in your choice of vibrant velvet colors, the Whitney Velvet Sofa is certainly not a subtle piece of seating, but one that is effortlessly exciting in its decadent details of lush button-tufting and the sleek gleam of unique spherical acrylic feet. Crafted with a doubly heaping helping of dense memory foam, the Whitney Velvet Sofa is as inviting as it is eye-catching. Generous cushions feature an added layer of memory foam for maximum comfort. Expertly upholstered in rich, luxurious velvet in your choice of bold hues. Unique spherical acrylic feet are stable and elegant. COMFY & COZY!! Really happy to chuck my old one and replace it with this!! OMG!! I love my new sofa!! Emerald green color is GORGEOUS! Goes even better in my Living Rm that I had even thought. Was a fun experience seeing all that you have to offer your shoppers. I will look forward to the next time I will need something for my home. Thank you soooo much. Everything is lovely. I'm so happy velvet is back!!!! 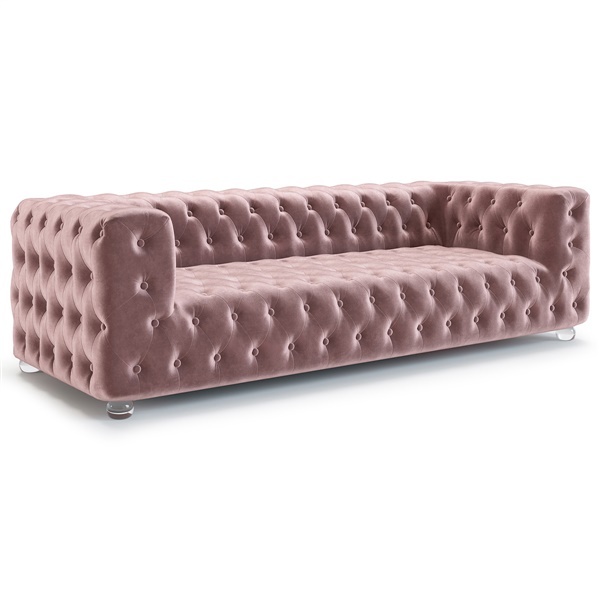 This sofa is absolutely everything I have ever wanted and it is affordable!!!! I am oh so excited about it and it looks so awesome in my house! I am thrilled from start to finish with my purchase. Definitely recommend Inmod and this sofa to anyone! How gorgeous is this sofa?! I am a salon owner and was in need of a new sofa for my reception area. I purchased this is the pink color to accommodate our existing decor. It was the missing piece to our business puzzle. Very excited with our newest edition to our salon!